OPGW or known as Optical Ground Wire is a type of cable or wire that is used in transmission lines construction. It is also known as optical fiber composite overhead ground wire. It can serve as a grounding wire, shielding wire, and at the same time a cable used for communication purposes. 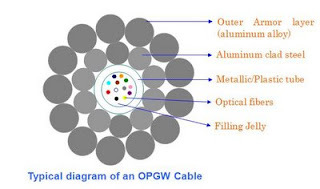 OPGW contains a tubular structure with one or more optical fibers in it. It is then surrounded by layers of steel and aluminum wire. It can be compared like an ASCR, except that steel is the one covering the tube with fiber optics inside. OPGW have the characteristic that there is no effect of high voltage induction on the data being transmitted through the Fibers. Hence this characteristic of the Fiber is taken into advantage to transmit the data along the high power transmission lines. OPGW cable is run, or installed between the tops of high-voltage electricity pylons, steel, wood, or concrete poles with appropriate fittings and attachments. The conductive part of the cable, in this case the steel serves to bond adjacent towers to earth ground, and shields the high-voltage conductors from lightning strikes. Optical fibers within the cable can be used for high-speed transmission of data. The electrical utility could use the fiber optics cable for its SCADA, protection and control system of the transmission line, VOIP, and other communication purposes. In such cases, they could save on the cost of installing additional steel wires serving as ground or shield wires to their lines. They could also lease or sold to third parties to serve as a high-speed fiber optic communication interconnection between cities, and other networks. 1. Relatively low cost solution to provide Communication and Data backbone trunks. especially advantageous in hilly, marshy, rocky terrain. 4. The cable is not damaged by human or animal actions as it is out of reach of both of them. 5. The cable is well protected by a bundle of strong steel or aluminum conductors. security is also available for the communication equipment. 9. Same optical equipment can be used as in case of underground optical fiber cables. 10. The data transmission capacity can be increased as and when needed by just upgrading the optical fiber equipment. The fiber once installed remains the same for its lifetime of around 40 years.